This set consists of 9 handpainted Urban terrain Tiles. These 30cm x 30cm (1'x1') Tiles connect magnetically and can be configured to create any Urban board. They come in 3 distinct themes: "Rustic", "Medieval" and "Modern" which cover a wide range of Urban environments and gaming themes. You can arrange them to simulate hundred of street layouts to fit any size of playing area, to suit each of your games. And, since they take up minimal space, you can store them in a small living-room cupboard. This is one of the Base Sets. You have to pre-order a Base Set before adding any more tiles and/or base sets in your order. 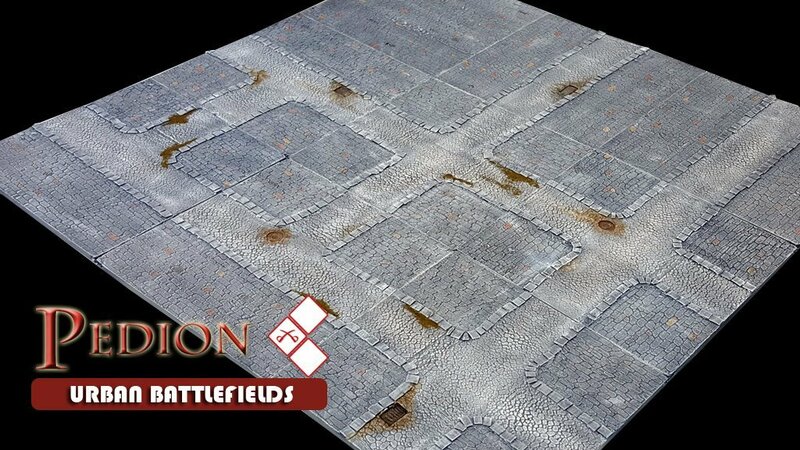 Not in stock - this is the pre-order the Pedion "Town" 3'x3' Urban Battlefield Set; this is the equivalent of the same Kickstarter Reward level, to be delivered in April 2018. If you play many games of Frostgrave (the excellent Skirmish game), or if you just enjoy the coolness of the Frozen City look, then this Upgrade is for you: you can update any (or all) of the tiles in your Medieval Set to look weather-beaten from snow storms. This option is available only for Medieval themed Urban Tiles. We treat the tiles with flock and resin, so that they get a white dusting, snow drifts and frozen ice pools on the streets. Please note that the Frozen City treatment is not removable - it will change the look of your medieval tiles permanently. Check the Gallery images for how this Option upgrades your tiles. However, there are some changes in the composition of Tile Types of the main Reward Sets. The reason for this is that the wider roads effectively half the urban area available for placing structures. Therefore the sets should allow you to have more open spaces to place buildings and not cover the whole table with a network of wide roads and almost non existent space between. Check the Gallery images for how this Option upgrades your tiles.